After bringing out some of the biggest comedy acts in the world such as; Michael McIntyre, Eddie Izzard, Jimmy Carr, Russell Peters and Jim Jefferies; Real Concerts is proud to announce that they will be bringing the biggest comedy show in the world to South Africa! The Kevin Hart What Now? Comedy Tour will be coming to South Africa for the very first time in March 2016; with shows in Cape Town, Durban and Johannesburg, with partners; M-Net channel 101, 947, East Coast Radio, KFM & Savanna Premium Cider. The tour has seen sold-out performances throughout the USA, Canada, UK and Australia. 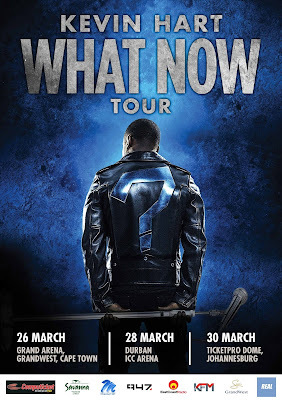 Kevin Hart has a massive fan following and in August of this year made history and performed to nearly sixty thousand people at the Lincoln Financial Field in his hometown of Philadelphia, which made him the first comedian to ever headline & sell-out a stadium show. Hart’s work ethic has translated into more than 30 pictures to his name with massive feature films such as; “About Last Night,” “Think Like A Man” and “Get Hard.” His comedy tours, movies, television hit series and primetime TV appearances in “Comedy Central’s Roast of Justin Bieber,” “Saturday Night Live” and hosting the MTV Video Music Awards in 2012 has turned Kevin Hart into a household name. Kevin says the most common question he gets after hit movies and sold-out football stadiums is, "What now?" hence the name of this tour. The tour has been dubbed, ‘The highest-grossing comedy tour of all time’ by Forbes Magazine, putting the comedian in a league all of his own.